As for those want to shop until they drop, the area are well catered for with the Bridges in Sunderland City centre and at the Galleries in Washington (or even the Gateshead Metro Centre further out). There are also suburban shopping areas in Fulwell, Chester Road, Pallion, Grangetown and Doxford Park. Retail parks can be found in Ryhope, Roker, Wessington Way, Pallion and Grangetown. 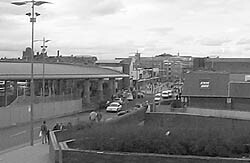 entrance to the Bridges Shopping Centre in the distance. Sunderland makes an ideal base for visiting the North East of England, with County Durham, Tyneside, Teesside and the beautiful North Pennines all within easy traveling distance. Then again the majority of those looking at this site will surely know this right? If not you’ll be pleasantly surprised by the city, its friendly people and “Mackem” accents and language.